Merry Christmas friends and family. 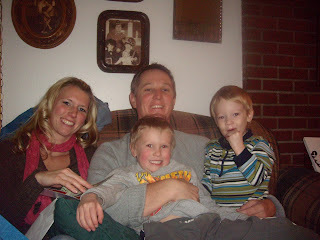 I can not believe that another Christmas is here and gone. Of course it was a great Christmas! We have not had a White Christmas for as long as I can remember & today we have had plenty of snow to keep me happy! 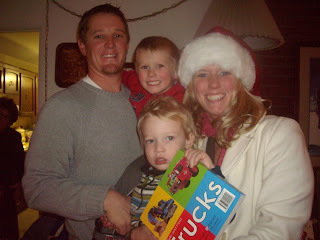 Here are a couple of pictures from when we went to see Santa. 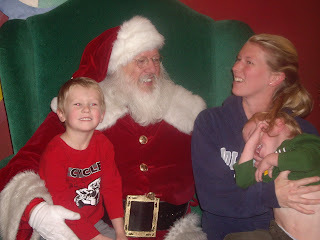 Dawson did not want anything to do with poor Santa and I am hoping that this is the last year where he decides to throw a fit :) I was not in the mood to be in another Santa picture. Needless to say, I hadn't showered so I just threw on a sweatshirt and put my hair into a ponytail! Don't you love the hair pulling action! 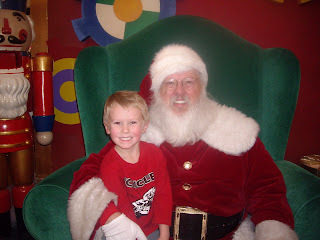 I think Santa was just happy it was me and not him! 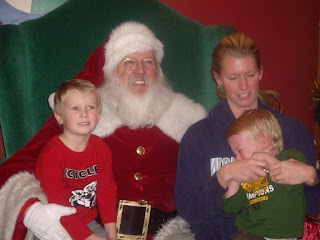 You gotta love the Santa pictures. The one of Landon is great. 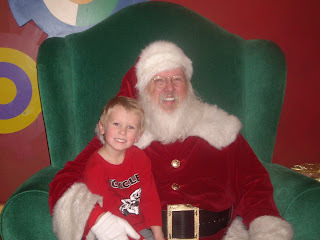 He made sure to tell jolly ol' Saint Nick that he wanted firetruck light up shoes (which he got from mommy & daddy).